Toyota hopes the Research Institute-Advanced Development will be "a company with different rules — like a startup." Toyota has invested ¥300 billion ($2.8 billion) in a new Tokyo-based company that will build software for self-driving cars, according to a report in the Wall Street Journal on Friday. The Toyota Research Institute-Advanced Development (or TRI-AD) will set out with 300 employees but the Japanese automaker hopes that number will grow to about 1,000 as the company takes off. Toyota has an ambitious deadline of 2020 for testing its autonomous, electric vehicles, which is part of the company’s larger goal of commercially expanding the availability and capabilities of self-driving cars. 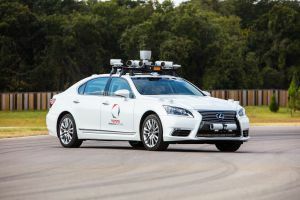 When Toyota first announced its 2020 goal, the company teased that the autonomous vehicles in development might come with AI functionalities that could facilitate conversations between vehicles and passengers. Toyota’s main goal with TRI-AD is ensuring the development of reliable software for the cars. “With automated-driving-software development happening around the world, there is a broad spectrum of software being written with a wide variance in quality,” James Kuffner, the new company’s leader told the Wall Street Journal. Driverless cars might seem far off from being commonplace on our roads, but autonomous vehicles are already on the streets in several cities. Self-driving vehicles have the potential to make our roads safer, and with companies like Toyota dedicated to investing in and improving the technology, by 2020 they could become far more commonplace.